Correct carburetor jetting is important for proper combustion. If the carb is jetted too lean the combustion temperature could get too hot resulting in either a seized piston, or a hole melted right through the top. Just one size too lean is all it takes for possible disaster, therefore we offer you some guidelines that you want to consider as you refer to them. HVCcycle is in no way responsible for any damage to your motor as a result of applying any of our advice or tuning specs. If you need to do it yourself to save the money, just be willing to be learn and accept the consequences of a piston failure. Remember, you seize or burn-down, it's your fault! Our recommended method is play it safe; get several main jet sizes in the range you're working in, and just start a little rich & work down. Carburetor adjustments, usually involving changing of quickly-removable metering orifices called jets. Besides the jets, needle position adjustment, or changing, as well as changing slides are all part of the adjustments available. Why the need for jetting in the first place? Any time a modification is made to the motor, such as install a different exhaust system, or air filter, you will need to re-jet the carbs to compensate for the difference in airflow. If air flow is enhanced, fuel flow must be adjusted accordingly. The optimum air fuel ratio is 15:1 for gasoline. It has to be just right. When exhaust gas temperature is optimum, 1250-1275 degrees F, the spark plug insulator will be a light tan color. Too hot & it'll burn light gray or white, too cool & it'll burn dark brown or black. Get familiar with exhaust note changes when jetting and get used to checking your plugs often. They are windows into your engine's soul. Other factors requiring jetting adjustments are changes in air density, altitude as well as types of fuel. 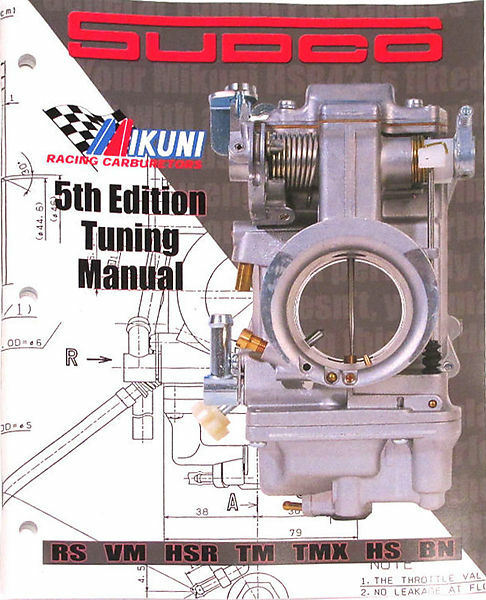 Get a Sudco Mikuni tuning manual if you don't feel real comfortable with carbs. It's worth it's weight in gold. Carb Jetting Guidelines - Just a ballpark range based on years of customer feedback and personal experience. Read your sparkplugs at different throttle settings, aim for a mocha, light brown color. Listed below are jetting specs that we use quite a bit. If you have a similar set up you can try the jetting listed.